After the Crash: Replace the Car Seat? You never saw it coming. A driver cuts into your lane, clips your right front fender, spins your SUV and forces it into a guardrail. The airbags deploy, you’re momentarily stunned and then suddenly you’re jarred into full alert mode as your toddler lets out an ear-piercing wail. Fortunately, your daughter isn’t hurt — she’s just confused and frightened. Her car seat protected her from injury and for that you’re immensely grateful. Although your car can be fixed, did you know that your child’s car seat or booster seat should be replaced following a moderate to a severe accident? It may look okay, but that doesn’t mean it is fit for duty. Indeed, the National Highway Traffic Safety Administration (NHTSA) advises that car seats or booster seats involved in certain types of accidents should be discarded. 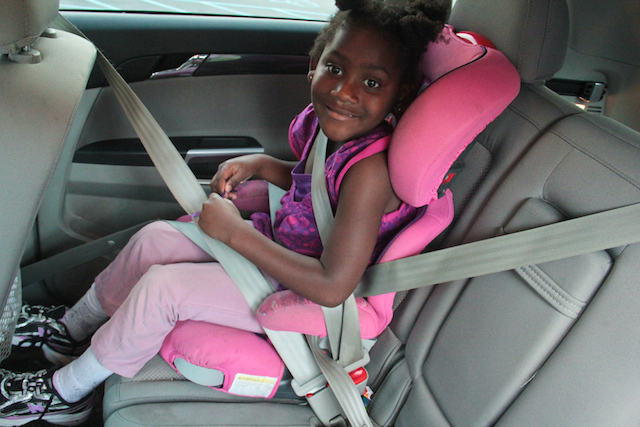 Recently, experts from CARSTAR — North America’s largest network of collision repair specialists — teamed with Evenflo, an innovator in child safety equipment, including car and booster seats, to shine a light on this little-known fact. Working with Shannon Spake, a Fox Sports host who covers football, basketball and motorsports, the companies drew attention to car seat safety as part of Child Passenger Safety Week this week. Spake is the mother of twin boys and like other parents is well versed in car seat safety. The vehicle was able to be driven away from the crash site. The vehicle door nearest the car seat was not damaged. None of the passengers in the vehicle sustained any injuries in the crash. There is no visible damage to the car seat. On the flip side, the NHTSA says to NEVER use a car seat that has been involved in a moderate to severe crash. Always follow the manufacturer’s instructions. What should consumers do? Evenflo recommends that consumers contact their car seat manufacturer if they have questions about car seat replacement after a crash. Make sure your child’s age, weight and height are within the requirements for any car seat you are considering for purchase. Check the NHTSA guidance to help determine what type of car seat is appropriate for a child’s size and development level. For help with car seat installation and use, contact your car seat manufacturer or find a certified child passenger safety technician near you. Car seat safety is no small matter. There are child passenger safety (CPS) technicians in your area who can help ensure your car seats are installed correctly and teach you how to install a car seat on your own. For more information, visit Safe Kids Worldwide. Children need special protection when riding in a car. Child car seat safety PSA. How *not* to buckle your child. More than 30,000 Americans die in car crashes each year, including 1,300 children aged 12 and younger. Car safety begins by properly buckling in all occupants with special consideration given to ensuring that children are adequately protected. The kind of protection used varies by age with the federal government recommending that all children under 13 sit in the back seat if one is available. Children aged 12 and under should ride in the back seat if there is one. Moreover, in some states such as California, Georgia, New Jersey and Wyoming, state law mandates using a rear seat for younger children if one is available. For the past 25 years new cars have been equipped with airbags, a safety protector for adults, but a lethal weapon that can kill kids according to the Centers for Disease Control and Prevention (CDC). 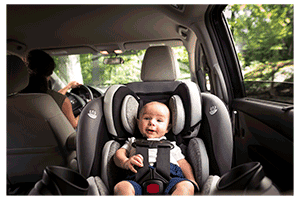 When young children outgrow their first child safety seat, a larger forward-facing seat should be used. Such seats hold children who weigh up to 40 pounds and must be used with the seat’s harness. Some of the newer seats have a higher weight limit and provide protection for kids older than the customary four-year-old child limit. Children from about aged four to aged eight can move to a booster seat once they reach the height and weight limits of their child safety seat. Belt positioning booster seats provide adequate protection and should be fitted with the upper (shoulder) strap crossing the chest and out across the shoulder near the neck. Kids should sit up straight with their knees bent at the seat’s edge advises the Insurance Institute for Highway Safety. Once children reach 4 feet 9 inches tall, a booster seat is no longer needed. Instead, youngsters should use seat belts just as an adult does. The lap portion of the belt should cross the upper thighs and the shoulder belt portion should cross the chest and out across the shoulder near the neck. To make it easier for parents to strap their kids in, the federal government mandates that car manufacturers install a lower anchors and tethers for children (LATCH) system to make it easier to attach child restraints to vehicle seats securely. Check your vehicle’s owner’s manual for instructions on how to connect child safety seats and booster seats. Child safety seats and booster seats can help reduce injuries and death, but they’re only as effective as they are used properly. Keep tabs on the safety of your seats by following the seat recall list and responding to those recalls immediately.